1. No Galvanic isolation – 230 Volt AC is directly connected so if the power supply fails, that destroys the circuit. More over, shock hazard is very high if handled carelessly. 2. Low current – Maximum current available from a transformer less power supply is 75 milli amperes. This varies depending on the input voltage fluctuations. 3. Unstable – Even if a Zener diode is used at the output, it will not provide stable output (see images). 4. Voltage fluctuation– Output voltage from the capacitor fluctuates according to the fluctuations in AC lines. 5. High input DC after rectification – Most of the AC capacitors give 25 to 40 volt DC after rectification through the Bridge rectifier. So using a Zener to get 6-15 volt output is risky, since the input voltage to the Zener is as high as 40 volts. Zener may destroy easily. 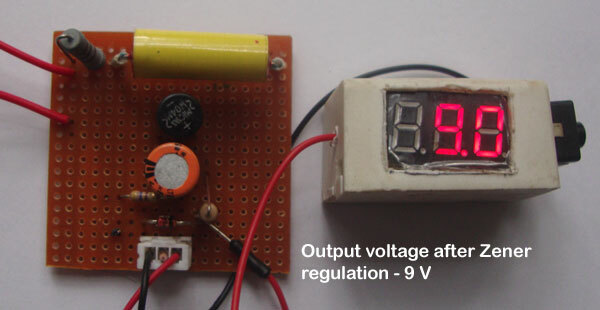 Even if Voltage regulator is used, this much high input voltage can damage the device. I think this is the major reason for the instant damage of many low cost gadgets available in the market. 6. Noise and transients – Since the power supply is directly connected to AC, Noise and transients in the AC lines will reflect in the output unless a filter is used. This cause problems in SCR and Triac controlled circuits and show false triggering. As you know, the mains AC is 230 Volt at 50Hz. We can’t use it directly for an electronic circuit because all semiconductors need DC for working. So we have to reduce the high volt AC to a low volt AC. A resistor can do that, but it causes wastage of energy through warming. So AC rated capacitors ( X Rated ) are used to reduce the AC voltage. These capacitors reduce 230 volt AC to around 15 – 40 volts AC. Note that, this voltage is based on input voltage. If it drops below 230 volts, a corresponding drop will appear in the output of the capacitor. 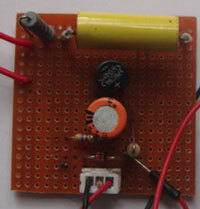 A simple Transformer less power supply is shown below. It uses a 0.47 uF 400 Volt AC capacitor with a 100 Ohms resistor in series. This resistor protects the capacitor from high inrush current at power on. An 1 Meg resistor (R2) is provided across the capacitor. This “Bleeder resistor” is very important to discharge the voltage from the capacitor after the switch off. Note that, the AC capacitor can store more than 600 volts even if the power supply is unplugged. This high voltage may remain many days. So the bleeder resistor immediately discharges the capacitor at power off. Its value can be between 470 K to 1 M.
The low volt AC then passes through the 1 Amps Bridge rectifier to convert it in to DC. So around 15 -40 volts DC will be obtained. 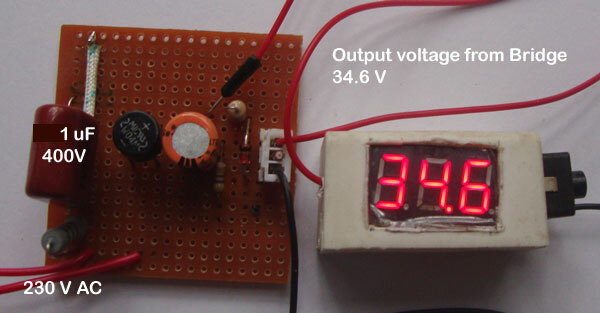 This voltage depends on the type of capacitor used. The DC is then made ripple free using the Smoothing capacitor (C2). Then a 9 volt 1 Watt Zener diode with the current limiting resistor (R3) is used to regulate the output voltage to 9 volts. After making the same circuit, I found the following problems. You can see it in the images. 1. First I used 0.47 uF capacitor. Its output DC before Zener regulation is 19.3 volts. Here comes the problems. 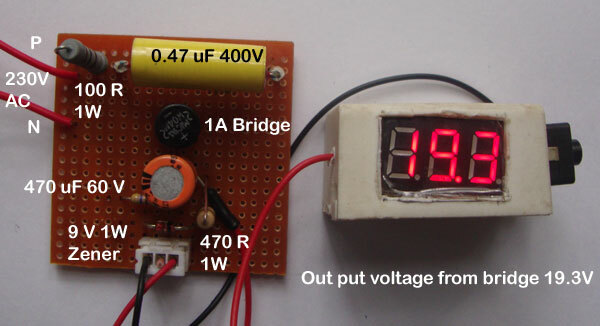 If an LED is used here as power on indicator, this much high voltage burns LED. If a high value resistor above 1.5 K is used, LED will not light properly. If the LED is used at the output after regulation, it drops around 2 volts, and the output voltage and current reduces. 2. Second thing is the fate of Zener diode. I used 1 Watt Zener which is the one easily available. A high voltage of 19 volt is flowing through the 9 volt Zener. So I think it will not survive many hours or days. 3. Output current is around 40 mA. So it can’t be used for a circuit because most of them require around 100 mA minimum. No relay works in this low current. If an LED is used, it takes 20 mA so balance only 20 mA is available for all the other components. 1. Output voltage after rectification is 34.6 volts. It is too high for the Zener. 2. Zener is not working properly and giving 9.9 volts instead of the regulated fixed 9 volts. 3. A relay based circuit is working on it since current is around 75mA. But the working of the circuit is not satisfactory. It is showing false triggering with the mains voltage fluctuations. So finally I decided to use these kinds of circuits to power LEDs in series so that the high DC will not make problems. For all other circuits, it is better to use Transformer based or SMPS power supply. Caution: The circuit given above is highly lethal and can give a fatal shock. Do not construct it unless you are experienced in handling high volt AC. Take all precautionary measures while handling the circuit. Do not trouble shoot the circuit when it is connected to mains. Do not leave the powered testing circuit on the work bench when you leave the place. Can i use a 9v transformer based power supply to that circuit? and i also have problems with sensitivity adjustment of the ldr. Can you please give me some tips on that….Thank you. Hello Mr. Mohan Kumar. I have a doubt. Can i use a box capacitor in place of X rated capacitor you used in your circuit? please explain.